What do these Amazon transactions mean? Here at A2X we often get asked by our new A2X users “How do I map my Accounts and Taxes?”. We understand this can seem like a daunting part of the set up process so in this article we will attempt to breakdown the terminology for you so it is easier to make sense of account coding and refine your mapping for reporting. Keep in mind, Amazon creates new transaction types all the time so while this article isn't doesn't contain an extensive list, we hope this guide will help you categorize transactions more easily. Disclaimer: This article is not meant to be used as accounting advice. It is simply an explanation of what we have learned about Amazon transaction terminology. Please seek the advice of a qualified accountant to establish the right account code mapping for your business. All examples use Amazon.com or Amazon.ca and USD. The explanations here are not market - or currency - specific. 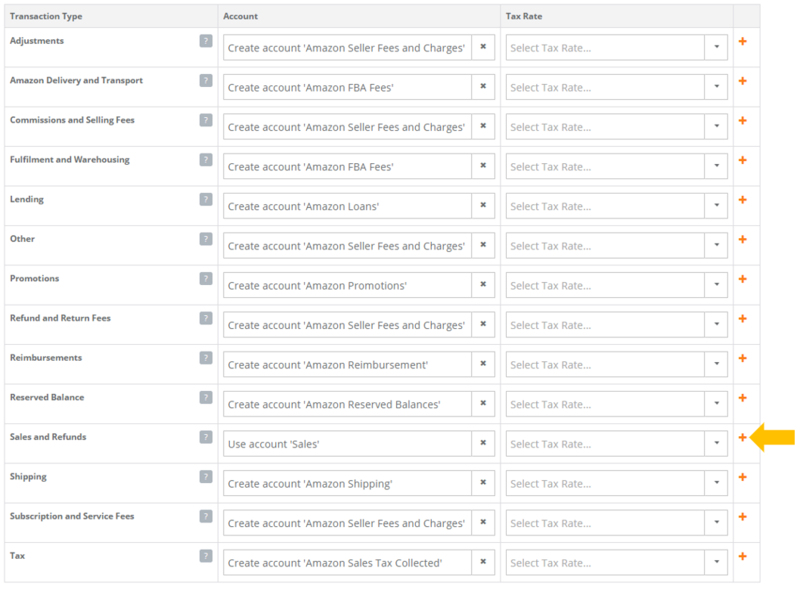 For those who are just starting out with A2X and have a fairly simple Amazon business (few SKUs, one marketplace), A2X provides an easy way to get started mapping your accounts by offering to create accounts for you in your accounting software Chart of Accounts. This is what the Accounts and Tax Mapping page looks like before mapping. The basic premise for the A2X-created accounts is simplicity. A2X creates only nine accounts under four account types (Revenue/Income, Expense, Current Asset, Current Liability) in the easy-start mapping of Accounts and Taxes. These are very general transaction categories, and because of this, some transactions in a revenue category may seem more like an expense, and some in an expense category may seem like revenue. An example is "shipping fees" found under the Shipping category, for which A2X generates a revenue/income account. Such categories are generally assumed to "net" Shipping revenue with shipping fees. A2X-generated “Amazon Shipping Income” shown in the example below is categorized as a Revenue type of account. Back in Accounts and Taxes, you can see the more specific transaction descriptions that come through your settlements when you use the orange “+” sign to the right of any general transaction category. What does the term, ItemPrice mean? “ItemPrice” always indicates revenue and it is associated with Orders, Shipping Charges, Giftwrap, and Taxes - anything charged as part of a sale to a customer. What does the term, ItemFees mean? The following screenshots show a variety of other fees. "Promotion" (or Discounts given to the customer) can be on “Principal”, otherwise known as the item being sold, or on Shipping. Remember this one from the beginning of this article? What do the words in ALL CAPS mean? There are literally dozens of reimbursements Amazon can be making to you. Amazon does not provide great explanations for the purpose of their reimbursements, so the best approach is to consider the words in ALL CAPS as the reason for the reimbursement. Other other transaction FBA Inventory Reimbursement INCORRECT_FEES_ITEMS - This implies that Amazon charged fees to the Seller on Items (as in ItemFees) incorrectly and is reimbursing the amount of the incorrect fees back to the Seller. Other other transaction FBA Inventory Reimbursement Customer Service Issue - This implies that there was a Customer Service issue related to FBA Inventory. It caused a loss to the Seller and Amazon has determined the amount to reimburse the Seller for it. Other other transaction FBA Inventory Reimbursement MISSING_FROM_INBOUND - This implies that there were items expected but missing from an inbound shipment to FBA Inventory. Amazon claimed fault for the loss and determined an amount to reimburse the Seller for the missing items. “Refund” in Refund and Return Fees transactions refers to the Amazon fees for handling items returned in relation to a refund, and Amazon charged processing fees to the Seller. These are just fees, not Refunds or Returns. The first is Amazon placing a hold on some of the Seller’s sales funds (net payment amount), often to verify product authenticity and usually when Sellers first start up their marketplace. The second is Amazon releasing those funds to the Seller. Note: When using A2X’s suggested default accounts, a Current Asset Account is created to map the Reserved Balances transactions. These transactions are neither sales nor expenses. They are simply funds held back and then released to the Seller from previous sales. The reserved balances affect the net deposit, not the total sales or fees. Note: This payment combines both Principal and Interest. A2X does not have access from Amazon for the actual breakdown. As a result, the Seller will need to look up the interest in Amazon and manually re-allocate the amount to interest in their accounting software. A2X creates only 8-9 accounts. Beyond these A2X-created accounts, mapping transactions to accounts and tax codes does take some accounting knowledge. If you are just starting out we recommend trying the default accounts that A2X can create for mapping Amazon transactions. We also recommend seeking advice from your accountant or bookkeeper as required. A2X mapping can be customized to your business at anytime. Our A2X Experts can help you dial in your A2X account mapping and help you with compliance to your country’s taxation laws. Please search our directory of experts or reach out to us at contact@a2xaccounting.com.